The Hoovers of Tyrone, PA are the 1000-yard shooting game’s “Fantastic Four”. 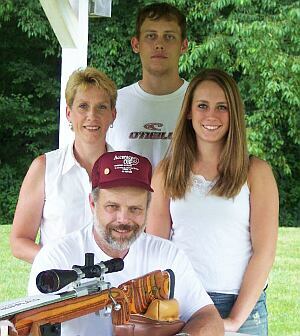 Patriarch John, wife Dianne, son Adam, and daughter Marissa are all superb shooters, each capable of winning a major match on any given day. Between them, the Hoovers have recorded myriad match wins over the past few years. As a team, the Hoovers won the 2001 IBS National Team Championship. John has won a host of major matches, and in 1998 he shot Williamsport’s first-ever perfect ten-shot 100-point score at 1000 yards (with five Xs). 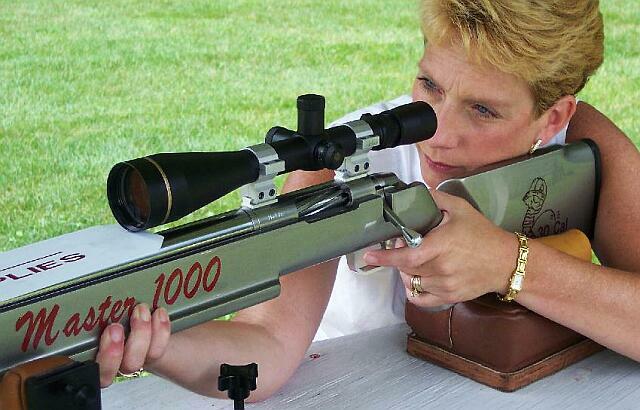 Dianne won the 2002 Light Gun World Open Supershoot at Williamsport, and son Adam matched that feat in 2004, winning the Supershoot two-gun overall championship. Proud father that he is, John says “the real highlights of my shooting career had to be when Adam and Marissa first won a Williamsport match. They were both just 12 years old when they did so.” Among 6.5-284 shooters, you won’t find many with more experience, or more victories, than the Hoovers. This week we’re honored to feature this unique family of shooters. In a lengthy interview, John shares a wealth of information about the 6.5-284, including advanced reloading techniques. 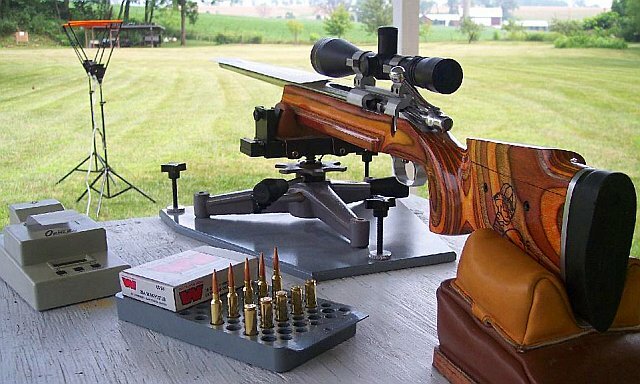 John Hoover’s 1000-yard rifle, at the bench on his “Backyard” 100-yard range. Note target at upper left. We should all be so lucky. All eight rifles use the same triggers, Jewells set at 14 ounces. John tells us “We’ve tried the 1-2 oz. triggers and none of us like them. That was just too light.” For optics, all the Hoovers use 8.5-25 LRT Leupolds. However, John and Diane use standard duplex reticles while the kids prefer the target dots. The Leupold LRT has enough elevation so that tapered scope rails are not necessary. Among the Hoovers’ eight guns, some have wood stocks, and some are fiberglass. John’s laminated gun is an earlier stock design with a low-profile fore-end and adjustable cheekpiece, while Dianne’s new silver gun uses the latest version of the “Master 1000” stock with a distinctive “step-down” fore-end and a fixed comb. Other than stock variations and the right vs. left action configurations, all the Hoovers’ rifles are built as identical as possible. They were all chambered with the same Henriksen reamer. In fact, John tells us that the chambers are so uniform that ammo can be interchanged between the guns, though normally brass is segregated by rifle. Wood vs. Glass–What Works Best? John tells us: “We mostly shoot wood stocks because we were shooting long before the glass Master 1000 entered production. As far as ‘feel’, if we were blindfolded, we could tell the difference mainly because the early wood stocks are about 2 3/4″ wide while the new Fiberglass version is 2.90″ wide. Concerning vibration, I personally don’t feel any difference. Some people may. The wife says she doesn’t feel any difference. She shot both glass and wood last week and didn’t sense any difference. When it comes to performance in extreme temperatures, I’ve never seen any differences between the glass and the wood versions. I attribute that to the way Alex Sitman inlets the barrel channel. He takes care to make sure the stocks are sealed properly. I’ve seen glass stocks at Williamsport that just have the barrel channel routed out–they are not sealed properly. That can cause problems. Comparing low-profile vs. step-down, I don’t feel any signficant difference in center of gravity or handling. In choosing between the two designs, it comes down to personal taste. Some people just didn’t like the looks of the step-down, and some do. We have eight of these rifles, My wife and I can shoot any one of them with equal ease. No one comes back and says ‘this gun feels funny’. Much of this comes back to Alex Sitman–he is very meticulous and he will build your rifle to exactly your specifications. If there is anything he sees that might hinder the balance or the tracking, he will let us know and we’ll talk about it and get it corrected”. Like many other shooters, the Hoovers use H4350 powder and Sierra 142 MatchKing bullets. But we asked John if he had any special reloading routines. Indeed he does: “First step, with new Winchester .284 brass, is to use a Redding full-length die. I screw the decapping pin out of the die and I use Imperial Sizing Wax on the cases. Then I run a K&M expander mandrel to push the ‘out of tolerance’ to the outside. Next step is to use my Wilson trimmer. When necked down, Winchester brass usually comes out 2.170-2.171″ OAL. I trim the cases to 2.167″ overall length. Then I debur the case mouths with a standard chamfering tool on a RCBS case prep machine. Then I use an inside deburring tool to get the inside of the flash-hole. The consistent case length is necessary because the flash-hole tool indexes on the case mouth. With his fired cases, John uses a more complicated procedure than most reloaders, involving three separate steps: “After firing, I full-length size the brass every time, using the same full-length die that is used for necking down. That pulls the neck down to .288-.289″. Next I run the K&M expander mandrel back in the case, to straighten and expand the necks. Finally, I run the case through a neck-sizing only bushing die. I try to set the bushing to only size about 50-60% of the neck.” So the three-stage process is: 1) Full-length size each case; 2) Expand neck; 3) Neck-size just the top half of the neck. NOTE: This seemed overly complicated to this Editor, but John feels the expansion step is critical to low run-out and consistent neck tension. Q: How did you get started in competitive shooting? I was born and raised on a farm and shooting and hunting was about all we had to do for fun. I was always fascinated by shooting long-range. We had a 20″ steel plate at 1000 yards on my father’s farm. I did my first 1000-yard match at Williamsport in 1996. I shot with a 300WM, the same rifle I used at the farm shooting steel plates. To be honest, in the first year of competition, with all the nervousness, I was happy just to be there and get all shots on paper. In ’97 we built another rifle. I built the new rifle because the wife would go to matches but not compete. I wanted her to compete, so I built a 6.5-08, something with less recoil. We went to a match and, to her surprise I told her “Hey Hon, you’re shooting”. A lot of it came natural to her. She was competitive almost from day one. We both shot the 6.5-08, but on different relays. It shot well, and we won a couple matches. When the barrel went on it, we got a new barrel in 6.5-284 for it. And then we built a second rifle nearly the same–she took the new one. We went to the 6.5-284 for more velocity and there was a little more information available for that caliber. Q: Is there one key factor that you think has contributed most to your success? You can’t attribute successful shooting to just one thing. I believe precision shooting is like one great big long chain–every link in the chain must be strong or you don’t have a chain. We try to pay attention to everything that goes into accuracy–equipment, good ammo components, good testing procedures, and we practice a lot. We’ve got a 100-yard range next to the house so we can practice more often than many other competitors. And every shot we fire here at home is shot over a chronograph. If there is one hardware factor that makes a difference, it may be the brass we use. I think I get a little edge from the boxed Winchester brass. Q: What’s so special about that boxed Winchester brass? When we started shooting the 6.5-284, the only brass available was Winchester brand .284. I found out Win-chester discontinued the .284 brass. I found a place that had stockpiled all the remaining Winchester brass–about 15,000 pieces. I got a good buy, and figured if we are going to do this a long time, it was a good deal–so I bought it all. This was boxed brass, 20 to a box. I feel that brass is far superior to any brass out there including Lapua and Norma. And this is why I say that. I went down the road with Lapua and Norma and I ended up swapping two barrels because I thought the barrels weren’t any good. The Norma brass was some of the first that came into the country. We just could not get the two guns working–everything was bad–ES, SD, accuracy–you name it. I tried almost every powder you could think of to get them to work. I did really poorly at the Supershoot and I concluded I needed new barrels. Well it turns out the problem was the brass, not the barrels. We did some testing with the chronograph. Dianne tried some rounds loaded with Winchester brass. She put five shots into one hole at 100 yards and the chron showed an ES of 3.0. We did this three times with similar results. Then we did the same with the Norma brass (some of the first batch that came into the country) and Dianne had a 2″ group at 100 yards. I have shot the newer Lapua, but not enough to give it a plus or minus evaluation. I’ve shot just enough of the Hornady to tell you it is very soft. I would not recommend Hornady brass in this caliber to anybody. All our competition has been done with Winchester. In the Tyrone area where we live there are about twenty 6.5-284 shooters that compete at Williamsport, and they are ALL shooting the Winchester, but that is bulk brass, not the boxed variety we use. Q: Why do you shoot every practice round over the Chronograph? First, we use the chronograph to select our match brass. After we have all the brass prepped and loaded, we’ll take 20 pieces of brass and shoot them over the chronograph. Out of those 20 pieces, we’ll take the 10 closest velocities. And that is our record string. We mark and number those cases 1-10. The shot that is farthest out of the 20 (velocity-wise) becomes sighter #1, the next farthest out is sighter #2 and so on, so that the shot that is closest to the record group velocity is sighter #10. This has worked for us. This has what put has 400 chunks of wood on the wall for us, so I think it works. The chronograph is really important for evaluating barrel performance. Using the chron we found that the guns shot better as the rifle fouled in a little. Meaning we picked up better numbers on the chronograph–low ES, SD. We’ll normally use 20-shot strings to test our loads in each gun. But, if I can’t get a single digit SD for five shots there’s no point trying to get it for 20. I’ll work with five shots until I do get satisfactory numbers. I also use the chron to test lots of primers. Up until 2003 I shot Fed 210Ms. I got another case of 210Ms. My numbers were a little higher with that second case of 210Ms than with the previous case. At that time, with everything the same, I tried some BR2s. Bingo my numbers came down, so I switched to BR2s. Recently I’ve been testing the RWS primers. They are showing even better numbers than the BR2s. That was promising enough that we used them in the last match we shot. Diane took first and I took second. Q: You say you select your “record-string” brass by velocity testing and then number each case. What is the reason for the numbering? All our brass in shot in sequence, 1 through 10, every time. So each piece of brass is always shot in the same order, even when we are practicing. Case #1 gets shot first, then #2 and so on. As we shoot a record string, they are put back in the same order. I even size and load them in that same sequence. This means the shot #1 that was fired last week is the same that was fired #1 this week. “What’s the benefit?” you may ask. Well, if we see a recurring bad shot with #3 for example, it will be culled. Then we will move the “best” sighter brass into the record string set. Dianne Hoover “behind the wheel” of the new model Master 1000 Stock. 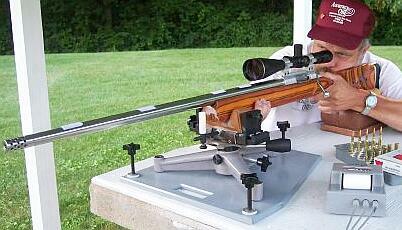 Dianne finished first in a recent NRA F-Class match with this 6.5-284 rifle, posting a 996 with 66x. She triumphed over a couple dozen male shooters, including husband John. Well done, Dianne! Q: Could you explain the “Hoover” style of gun handling for us? Have you ever tried free recoil? Everyone in the family grips the stock. We all hold on pretty good. Not because the gun jumps out of your hands. We’ve just learned you have to control the rifle and you do that by getting a good grip on the rifle. None of us shoot free recoil. We use a fairly solid cheek weld. I use a “two-hand hold”. Since I’m a lefty, my right hand holds the front of the stock by the front rest. I do all my elevation adjustment with my shoulder. When we start shooting, after the first couple of sighters, our heads never leave the stocks. We’re constantly watching through the scope with a constant head position and cheek weld. I think that’s important. If someone moves his head all the time–what’s the chance his head to stock alignment will be the same for every shot? He may get it close, but not as close as if he puts his cheek there and leaves it there. Q: All the members of your family have been very successful. Are good shooting skills genetic? Well I don’t know about genetics, but there are a number of reasons we’ve all had success. We have excellent equipment. You’ll recall I’ve said accuracy is a like a chain, and every link needs to be strong. We put a lot of time into all parts of the chain: stocks built properly, good metalwork, ammo is done correctly, and we do a LOT of practice. We practice hard–total, counting matches, we’ll probably shoot 1200-1500 rounds from March to mid-October. By the way, all our testing is done at 100 yards. Some people think you can’t learn anything at 100 yards. We’ll I disagree. The bench we shoot at home is exactly the same as the bench at Williamsport–a carbon copy. I believe, when you practice, make everything as identical to match conditions as possible. Finally, a big part of our success is that the whole family is in it. We’re all there together. I would not enjoy the game as much if I was just shooting solo–I would not take as much time to do it if my family wasn’t involved. Q: What makes the 6.5-284 so good? I think the bullet companies have put a lot of time into making really good bullets in 6.5. When that .284 cartridge came out, Winchester developed that case to duplicate the capacity of a 30-06 for a short action. This was the only American-made cartridge with a rebated rim, prior to the ultra-mags. The powder column is just the right capacity. I don’t think it has excess capacity. Everyone is trying to reinvent the wheel but it is still going to come out round. I speak about what it has done for us. With the way we do things, it works. Q: Is the 6.5-284 fully refined–Is there room for improvement? If it can be refined to get more accuracy out of it, I personally don’t know what it would be. The accuracy is there. There may be some tinkering to find another sweet spot. But I don’t see any big break-throughs with a different bullet or powder. Q: Have you considered other cartridges for 1000 yards? Quite a few people say you need to shoot 30s when the conditions get bad–that the heavier bullets buck the wind better. I disagree. I’ve shot right with the 30s in all conditions. There’s always the debate–the Six-Fives vs. the 30s, which is better. Well let me share some facts. In 2003 I went through the Williamsport newsletters. The 30s then outnumbered the Six-Fives by three to one on the Williamsport firing line. For 2003, I logged ALL the match results for the entire year, including all relays. At year’s end, despite a three to one advantage in numbers, the 30s only had had one more victory than the Six-Fives. And today? Well now half the Light Guns are Six-Fives. Q: How about straight 284s? I’ve only seen a couple at a match. There are some guys coming on with a 7mm WSM. But I would never move to 7mm. I’ve put too much time into the 6.5-284. I do some things getting the brass ready that others may or may not do, but it seems to work. I’ve never had a 6.5-284 I couldn’t make shoot. I have eight long-range rifles and everyone of them is chambered 6.5-284, all done with a Hugh Henriksen reamer. At our Accuracy One shop, we carry 100% identical Henriksen reamers, that will cut a carbon-copy of our chambers. Q: What is Your Favorite Load? We shoot Hodgdon H4350. In cold conditions in the early season and even in the heat of the summer we pretty much use the same load. We fire-form with 48.0 grains, while the match load is 49.0-49.5 with 142 SMKs. Seating depth is about .015″ into the lands, but I think when I close the bolt the bullet moves a couple thousandths. I’ve been running CCI BR2 primers for a while now, but just recently we’ve been testing the German RWS primers. They’ve show very low ES and SD, and fewer unexplained flyers. Using the RWS primers, just last week (July 16-17), Dianne and I finished first and second respectively in a Regional NRA High-Power Match, shooting in F-Class. Dianne posted a 996, 66X score for 100 rounds, and I shot 995, 62X. So the RWS primers did the job. 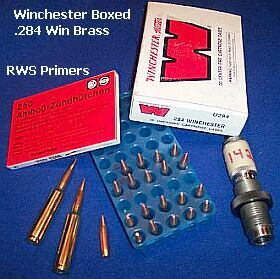 As noted above, we use older Winchester boxed brass, which is 5% lighter than the bulk Winchester brass. If you are using the heavier Win bulk brass or Lapua brass you need to drop one grain. Our loads run 2975-3000 fps. Yes, I can get more velocity from our Winchester brass. I can push the 142 to 3200 fps but there’s no benefit–every time I’ve tried doing that you string ’em up and down the paper. You get vertical stringing at 3150 fps on up. So we shoot for the magic number of 3000 fps. Q: What are the best long-range bullets for the 6.5-284? You name a bullet and we’ve shot ’em, though we have not shot the Bergers or the Amax in competition. We’ve shot 141gr Cauterucios, the 140 JLK, and the 142 Sierra, all naked bullets. I’ve never shot moly bullets. If I had to pick one bullet I’d pick the 142 Sierra. The others are excellent bullets, but JLK is no longer in business. We did well with Bob Cauterucio’s bullets, but I understand with the jacket situation and the lead situation, sourcing components can be difficult for the small bullet makers–so you can’t always count on getting their bullets. With the 142 Sierras, I order a dozen 500-round boxes at a time, and I specify all the same lot number. Sierra has been very good at delivering that. Q: Do you sort and measure your bullets? Yes, I have a bullet comparator that measures the bearing surface of the bullet. I use a JB Bullet Comparator sorting tool and sort into groups of .001″ bearing surface length. With the Sierra 142s, I’d say well over half the bullets are within .001″ to .002″, maybe closer to 75%. The next thing I do is trim the meplat–I do this with every bullet. I use a special meplat uniformer developed for my shop, Accuracy One. After trimming I just hit the outside with some fine steel wool. Is it worth it? Well, I started trimming meplats two years ago, and I believe the groups are smaller and more round than before. I don’t use a Juenke machine. Folks ask me, “Do you spin your bullets?” To them, I say “Yes, when they go out the barrel.” I used to do the Juenke sorting years ago but I never shot any better by doing it so I stopped. Q: Do you have an opinion on moly vs. naked bullets? I shoot naked bullets. I’ve never had reason to change. From what I know about moly the benefit would be not having to clean as often. But that may not be as important as people think it is–because some people clean more than they need to, moly or no moly. Q: How often do you clean your barrels, and what is your procedure? I feel a lot of people with 6.5-284s clean too much. Only speaking about the Six-Fives, people don’t believe this, but we’ve sometimes gone 200-250 rounds without cleaning and then shot a match and won. We shot a match at Williamsport, including a shoot-off, then, without cleaning, we shot the Nationals at Quantico. We did not clean after Quantico, but then won our next match at Williamsport. At that point the barrels had about 200 rounds through them. Let me tell you a story. A while back when three of us were shooting I was very faithful with “20 shots and scrub that barrel”. I was run ragged trying to get the guns clean for multiple relays and shoot-offs. I was getting rung out. One day I just didn’t have time to clean, so I told the kids “just go shoot it.” Bingo, they won the match. These days, I typically shoot 60-70 rounds between cleanings. If I clean after a match, we’ll put some practice rounds through the bore before the next match and leave it that way–no oiled patch. We always go to a match with a fouled bore, but I DO keep the muzzle brake clean. I’ll screw the brake off put it in solvent and clean the muzzle crown and the threads where the brake screws. Q: Are there common problems 6.5-284 shooters encounter? Well I do see some common mistakes folks make when they get started with the cartidge. First, and this would probably hold true for other calibers as well, many people have a hard time understanding the bearing surface to boat-tail relation, so they get the seating depth wrong. A lot of the people have the base of the bearing surface below the neck-shoulder junction. The standard 6.5-284 reamer is made for hunting bullets so the throat is too short for the long bullets we use. Second, well I see many guys with too little chamber clearance for the necks. You need .003″ clearance on a loaded round, minimum, and .004″ won’t hurt. Third, neck tension–there IS a happy medium. We neck-size our cases with a .290″ bushing for a .293″ loaded round. That works well for us. That’s enough tension that if you have to unload a loaded round and the bullet is in the rifling it won’t release and dump powder. Q: Barrel wear is an issue with the 6.5-284. What can be done to extend useful barrel life? If you slack off one place you’re going to pay elsewhere. If you reduce your velocity you will suffer downrange. Most top competitors are willing to replace barrels after 800 rounds or so–that’s just part of the game. I will say, however, that I’ve had good results with setting back barrels. We used to do that part-way through a season. Recently we’ve gone a full season before setting back the barrel about 1″. I’ve seen no significant loss in velocity or accuracy from setting back the barrel from 30″ to 29″ or so. In fact, I’d say pretty much every time we’ve set back a barrel it shot as well or better than before. And it continues to shoot accurately for many hundreds of rounds. Depending on how much shooting you do between matches, you may be able to extend your barrel’s life from one season to nearly two. Q: Do you have any advice for folks getting started in long-range shooting? Number one, a person can only do what his pocketbook will allow. You don’t need ALL the most expensive gear. I tell guys to look through the Williamsport Newsletter. See what’s winning. See what guys are winning with–what kind of barrel, what caliber, what stock. If 100 guys are shooting Krieger barrels–it’s a no brainer. A big part of your homework is already done for you. Second, you can’t stress practice enough for the new shooters. Some of them don’t pick up their rifles between matches. That won’t get it done. You have to practice. It’s like anything–you have to practice between matches and my family does that all season long. Q: How about finding a mentor, is that important? Q: So what does the future hold for you, shooting-wise? Do you have anything new up your sleeve? As we speak, I’m having a new gun built in 6XC. 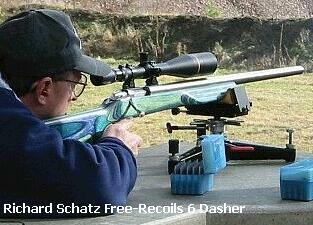 It will use the Tubb brass with DTAC 115gr bullets and a 1:7.5″-twist Krieger. I will try this at 1000. The primary reason is I know David and he’s working with me on it. I think it’s an interesting cartridge. I want to try something new. David chambered it for me. He recognizes we [the Hoovers] have done well in the 1000-yard game as a family and David is interested in seeing the round used more in 1K Benchrest. But I haven’t shot the gun yet so I can’t tell you how it performs. A few years ago, John Hoover started a small shooting supply business, mainly to provide reloading components for the many long-distance shooters in his corner of Pennsylvania. Over time the business has grown and he now has a shop on his property, with regular hours Monday, Wednesday, and Friday, 6:00-9:00 pm. Accuracy One carries powder, bullets, Master 1000 stocks, reamers, JB Bullet Comparators, meplat trimmers and other tools. He has Krieger barrels in inventory, with Schneiders on order. 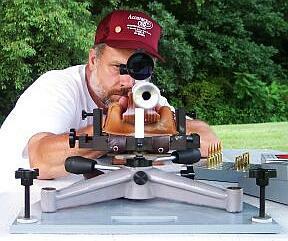 John is not a gunsmith, but he’s happy to help customers with component selection and gun tuning. He also sells the hard-to-find German RWS primers. John’s recent tests showed these work great in the 6.5-284. ES and SD have been a digit or two better than CCI BR2s (his previous favorite). More importantly, the RWS primers seem to produce fewer unexplained flyers at 1000 yards. Basically I see four ways to hold a rifle riding sandbags, but each can be modified to suit your situation. Free Recoil (FR): finger on trigger only with little or no pressure from your shoulder on the buttstock. The rifle moves on its own, with guidance from the bags until your shoulder resists it enough to stop rearward movement. Thumb Pressure (TP): In this case, shoulder position is the same as free recoil, but you apply light, consistent pressure with your firing hand thumb. This helps tame a little more recoil energy than shooting FR. Hard-Hold One-Handed (HH1): Here you have firm contact with the entire shooting hand, and shoulder. Most long-range BR competitors shoot this way. It allows bag-squeezers to reach around and adjust the rear bag with their off hand. This hold will lessen felt recoil more than FR and TP. Hard-Hold Two-Handed (HH2): I don’t think this exists in short range BR, but several successful shooters in long-range BR use this method. This is the same as HH1, with the addition of hanging your non-firing hand on the fore-end. Due to the amount of contact with the stock, this style is undoubtedly the most difficult to do consistently. How you hold your rifle also depends, to a great extent, on the balance and recoil. A rifle that is barrel-heavy and doesn’t balance well on the bags will probably not work shooting FR, and will most likely give vertical stringing. Basically FR and TP will be most affected by rifle balance and recoil, while HH1 and HH2 will be mostly affected by shooter consistency. 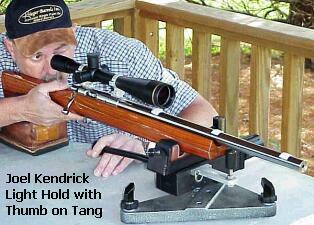 Many folks find it easier to shoot FR (or barely touching) with a low-profile stock with a low center of gravity, such as a Shehane Tracker, Kelbly Klub (Adamowicz design) or the Terry Leonard benchrest stock Joel Kendrick is using in the picture below. “Free Recoil” probably conjures an image of a nearly flat, low-riding 6PPC with a flashy paint job, but this style is present in long-range BR as well, with more conventionally-shaped stocks. I like to shoot this way, as I want to take out as many variables as possible. It just so happens that my 1000-yard BR rifle also likes to shoot this way, even with a fairly conventional Tracker-MBR stock. The flat in the underside of the stock does help stabilize the rig on recoil. The best way I have found to discover your optimal hold for maximum precision is to set up a target at several hundred yards (my test was at 400) with several aiming points oriented vertically. This is done so you can dial the front rest up to the next point and fire another group as fast as possible. I start with a few sighters to get the zero where I want it (just below POI). Then starting with the least contact (FR), shoot a 3-shot group at the bottom (or top) target. Then dial to the next target in line and go to the next hold (TP), then HH1, and HH2 on the remaining targets. When finished, you should have four 3-shot groups, all with different holds, and should be able to clearly see which hold your rifle likes best. When in doubt, or if two groups are similar, my next step would be to move the targets further out, and shoot more shots in a group to decide between the holds that gave similar results. 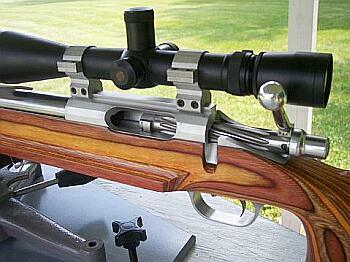 Try this exercise, and you may find your rifle shoots even better with a different hold! Photos of Hoover guns and range, Copyright © 2005, the Hoover Family, used by permission, All Rights Reserved. All other content Copyright © 2005, 6mmBR.com, All Rights Reserved. No reproduction of any content without advanced permission in writing. Topics: John Hoover, Dianne Hoover, Adam Hoover, Marissa Hoover, Master Class Stocks, Master 1000, Accuracy One, 6mm, 6mm BR Norma, 6BR, 6.5-284, 6.5×284, 6.5mm, 6PPC, 6 PPC, .308, Williamsport, IBS, NBRSA, Stolle, Panda, Score, Group, Agg, Aggregate, Benchrest, 6mm Improved, Light Gun, LV, HV, 6PPC, Schneider, Krieger, 300m, 600m, 1000 yards, Jewell, Shehane Tracker, Terry Leonard, Benchrest, BR, Bench Rest, rifle accuracy, Recoil, Hodgdon Powder, H4350, H4831, Vihtavuori, Lapua, Sierra, Match-King, JLK, Cauterucio, Scenar, Competition Shooting, Stocks, Leupold, Kelbly Klub, Adamowicz, Lee Six, Borden, barrel, reloading, powder, case forming, neck-turning, Lapua Brass, Winchester, bullets, precision, Alex Sitman, Laminated, Fiberglass, Hard Hold, Juenke.